If you have been following along this series on supply chain strategy so far, you would have gone through the conventional supply chain strategies of Lean, Agile, Speculation, and Postponement. In each one of these strategy reviews, I explained why they fall short of guiding a supply chain design in any meaningful way, finally introducing the supply chain sphere of influence and the need to identify what drives your supply chain. 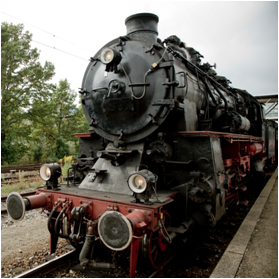 Supply chains can only manage demand, supply, inventory, and resources. Therefore, any strategy mandating supply chains to do anything else is not going to help. 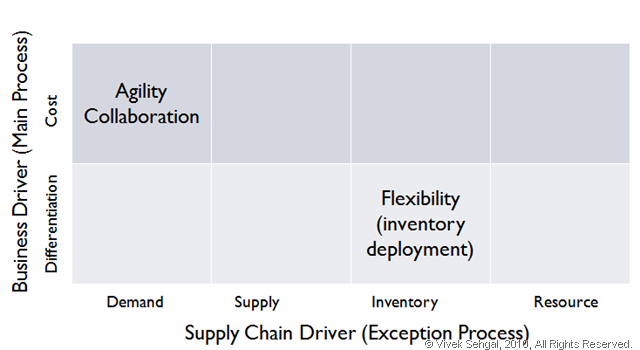 The supply chain driver is largely determined by the characteristics of the industry, products, and customers. The combinations of these attributes establish the basic nature and constraints of the supply chain capability requirements and therefore, it is largely not an option to be selected. Supply chains exist only to support a business, therefore, a supply chain strategy must sub-ordinate to the business strategy. This means that supply chain strategy cannot be designed in a vacuum, but must be aligned with an explicit business strategy. This is an explicit choice on behalf of the business and depends on the business model that a firm wants to pursue. These two principles are shown graphically in the picture below. On the horizontal axis, identify the main supply chain driver from the supply chain sphere of influence. On the vertical axis, identify the main business driver (I have shown only cost or differentiation) that defines your business strategy/model. Remember these two align with the two core principles above. The business strategy driver helps in designing the main supply chain process orientation, for example, a cost-driven business will drive supply chain processes designed for asset-efficiency and high resource-utilization. The supply chain driver helps in designing how the exceptions will be handled within the supply chains – what happens when supplies don’t match demand, or enough inventories don’t exist within the network. Together, these drivers help design processes that match the organizational business objectives while simultaneously addressing the operational needs. And that together creates competitive advantage. For example, if you selected a demand driven supply chain with cost as business strategy (cell 1 above, think of a typical retail supply chain), you would be designing processes with the intent of creating operational efficiencies while a supply chain with inventory as a driver and differentiation as the business strategy (cell 2, think of a typical aircraft maintenance supply chain) will focus on processes to provide flexibility in quick inventory deployments within the network. These characteristics are shown the picture below. Of course, the supply chain design in the other cells intersecting at other possible combinations will follow their own prominent characteristics to suit the combined effect of business driver and the nature of supply chain operations mandated by the industry, product, and customer characteristics. These are discussed in detail in my book on supply chain strategy. This is a new design imperative, a new concept, for designing effective supply chain strategy and building processes that create competitive advantages aligned with the needs of the business strategy of the firm – that is the basic theme of leveraging supply chains as an asset. While the conventional supply chain strategies will give you all the buzz-words, it is only through understanding the business goals and operational requirements, that you can actually build a supply chain strategy that is effective. Next, I will cover some of the key characteristics of supply chain processes that must be designed for building competitive advantage and reaching your business goals. Till now, we have discussed the most common of the supply chain strategies: lean, agile, speculation, and postponement. In doing so, we also highlighted the underlying concepts behind each of these so-called strategies and why they fail to deliver as supply chain strategies. Then the last post, we summarized the reasons for why the generic supply chain strategies fall short: because they fail to direct how supply chains should manage what is common across all supply chains, but rather issue call-to-action in terms of the impact of such management (cost, flexibility, etc.). This is in contrast with the generic business strategies that leverage what is common to all businesses – selling of products and services to its customers, resulting in generic strategies of cost, differentiation, and focus. Management of demand. While the end consumer demand is an independent variable, once the finished goods demand has been forecast, it is the supply chain processes that propagate the demand along the supply chain nodes. As the demand propagates through the network, supply chain processes may determine the optimal way to fulfill this demand, including where, when, and how this will happen. For the manufacturing supply chains, this propagation will take the demand to the warehouses, then to the assembly plants and factories, and finally to the raw material warehouses and vendors. Along the way, the finished goods demand will be broken down into its subassemblies, components, and raw materials using a bill of materials, as well as into its manufacturing operations and resources, using the bills of routing and resources. For retail supply chains, the propagation process will take the demand to its warehouses and then to the suppliers. Thus,while the end demand may be independent, the supply chain processes have a huge impact in managing demand through propagation and determining the fulfillment methods throughout the supply network. Management of supply. As the demand is propagated from the customer end to the supply end of the supply chain, the replenishment planning processes start creating the fulfillment plans, which results in an opposite propagation of supply to fulfill the demand at every node for every finished product, work-in-progress (WIP), or raw material. The replenishment plans finally drive the procurement process that replenishes the supply chain inventories from the firm’s suppliers. Supplies from the vendors are managed through purchasing and logistics to replenish the supply chain nodes from where the supply propagation continues toward the demand end. These processes of demand and supply planning must work in concert for a smoothly run supply chain. 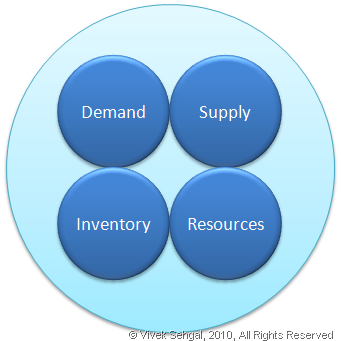 Managing supply with demand is the most important function of a supply chain and since neither demand nor supply is static, the agility with which they are planned and replanned differentiates one supply chain from another. Management of inventory. This is the third part of the puzzle that supply chains directly control. Inventories make it possible for the supply chains to react to the changes in supply and demand while simultaneously maintaining acceptable fulfillment rates. However, inventories add cost that directly comes from the working capital of a company and therefore, needs to be reduced as far as possible while protecting the ability of the supply chain to service the demand. Supply chain processes of inventory classification and inventory planning help the corporations achieve that balance. 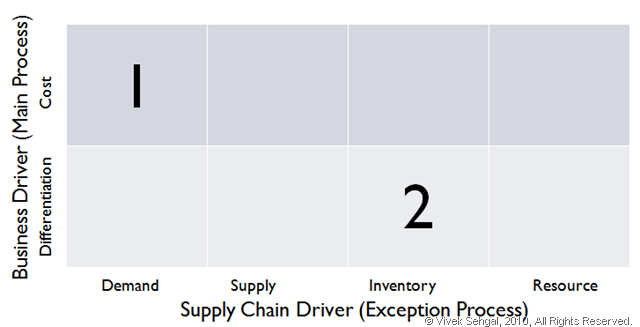 The quality of the inventory planning processes depends on the underlying science, accuracy of historical and forecasted demand, supply and lead-time data, and cost models for inventory. The results of this process directly affect the leanness of a supply chain by affecting inventory costs and affect agility by maintaining demand fulfillment targets under varying conditions of demand and supply. Management of resources. This is the last component of the corporate operations directly affected by supply chain processes. It is also the most complex and wide in scope since resources encompass so much in a corporation—they are the people, machinery, warehouses, trucks, forklifts, conveyors, and so on. A lot of these resources enable supply chain processes in the corporate offices, warehouses, factories, ports, in-transit, and stores. Supply chain processes create resource plans and affect the efficiency and utilization of these resources. Throughput in a warehouse or factory is a direct result of efficient planning and scheduling capabilities. In a wider definition, one could consider inventory and cash as resources as well. We chose to consider inventory separately since there are very specific supply chain processes addressing inventory planning. Cash is a legitimate resource for a corporation and even though supply chains impact it through working capital (inventory and operations), receivables, and payables (cash-to-cash cycles), we do not consider this in the primary sphere of influence of the physical supply chain. The reason to do so is that while supply chain capabilities impact the financial results, they do not manipulate cash as they manage the other components of inventory, demand, supply, and resources. Next, we will continue with defining how can the supply chain sphere of influence help build a supply chain strategy and help define a roadmap of evolution for the supply chain competency for a firm. So far, we have discussed the most common of the supply chain strategies: lean, agile, speculation, and postponement. In doing so, we also highlighted the underlying concepts behind each of these so-called strategies and why they fail to deliver as supply chain strategies. A comparison with Michael Porter’s generic business strategies will further clarify why the above concepts don’t qualify as supply chain strategies. Porter introduced the generic business strategies as cost, differentiation, and focus. These generic business strategies are based on these three factors because these three factors are common to all businesses, across all industry segments, all products and services, all demographics, all geographies and so on. Since all commercial business activity involves selling (cost) of products and services (differentiation) to its customers (focus), therefore, cost, differentiation, and focus are common attributes to all business activity. A business’s ability to control and leverage any one of these common attributes is what allows Porter to define these generic business strategies, applicable equally across the whole business landscape. Therefore, focusing on any one of these three can serve as an effective business strategy or business model that is generically applicable. Now think of the conventional supply chain strategies in a similar context: What do supply chains control? What is truly common across all supply chains irrespective of whether they belong to a manufacturer, retailer, distributor, or service provider? Only such basic characteristics that are specific to supply chain functions will be truly acquiescent to qualify as generic supply chain strategy drivers. Notice that lean and agile do not fit in this category being too generic and therefore applicable across everything a business does. Nor do speculation and postponement qualify because they are situational business models that their attendant supply chains must support and not generic supply chain drivers. To answer the above questions, we must first understand the supply chain sphere of influence. Without understanding this sphere of influence clearly, we run the risk of creating supply chain strategies like lean and agile or speculation and postponement, which are higher-level business directives and are equally applicable to all business functions. While they set the tone for supply chain functional capabilities, they do so to no more extent than they set the tone for merchandising or financing or any other corporate functions. In this context, they serve no better purpose than reinforcing the business strategy’s guidance for all business functions without offering any specific insights for creating supply chain capabilities. The supply chain sphere of influence helps one to understand what supply chains can and cannot affect. Only then, can one proceed to define how supply chain strategies can be formulated and how best to leverage them to create competitive advantages and support business goals. Next in my series on supply chain strategy is the speculation as a strategy. As a refresher, in this series, we have so far covered the three other conventional strategies generally thought of as supply chain strategies and seen why they lack the credentials of being a true supply chain strategy: These were lean, agile, and postponement. However, just as postponement was more of a business model and less of a supply chain choice, the same is true for speculation. The ability to leverage economies of scale or speculation is not a choice: It is an imperative imposed by the type of industry, assortment, and demand patterns. Consider, for example, an assemble-to-order manufacturer such as custom-built gaming machines must adopt postponement, because the speculation strategy will simply produce too many unwanted machines, making the business model unfeasible. In real-life businesses, the business model, dependent on industry, products, and demand patterns, forces a business model that is either speculative in nature or allows for postponement. The business model pursued then casts the requirements for a supply chain that must simply support the business. Therefore postponement or speculation remains a strategy for business and not something open for the supply chain to ponder upon and pursue. The situations in which speculation or postponement is an explicit choice to be made for a supply chain are limited, but may become real options for specific categories of products or sales channels of a company. For example, consider Dell with their new business model to sell through the retail stores. In the changed scenario, Dell must master a speculation model of supply chain to fill the retail channels with prebuilt machines, but they can continue to use their postponement model of supply chain design to effectively build machines for their online sales of computers. In my next article on the ongoing discussion on supply chain strategy, I will conclude on the conventional strategies discussed so far: lean, agile, postponement and speculative and summarize why this conventional framework of supply chain strategies is not adequate for guiding any real supply chain design for a firm. Next in my series on supply chain strategy is the postponement as a strategy. Till now in this series, we have covered the lean and agile as supply chain strategies and this is the third conventional supply chain strategy I will be talking about. The postponement strategy is based on the following two basic principles of demand forecasting. The accuracy of the forecast demand decreases with an increase in the time horizon. The farther the time window for which the demand is being forecasted, the more inaccurate it will be. 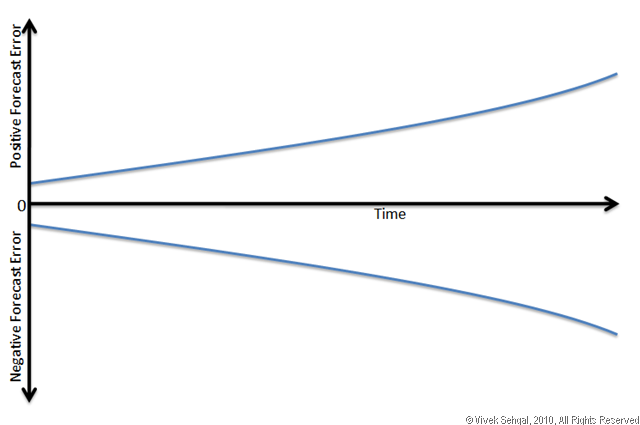 The figure graphically represents this effect as a funnel: as time extends farther into the future, the forecast error grows, showing that the forecast demand will have larger and larger variations as time periods progress into the future. Demand projections for a product group are generally more accurate than projections for individual products. For example, it is much easier to forecast the total demand for LCD TVs than it is for an individual TV of a specific brand, model, screen size, resolution, and color contrast ratio. The postponement strategy leverages the above characteristics of demand forecasting. It dictates that the firms should postpone the creation or delivery of the final product as long as possible. For retailers, this takes the shape of postponing the delivery of the final product to its destination, while for assemble-to-order manufacturers this means postponing the final assembly of the product. For manufacturing scenarios like build-to-stock, the postponement strategy may drive pushing the packaging or final assembly of the products, allowing the manufacturer to personalize, configure finished products to customer orders, and change the final product mix to suit any changes in demand. The postponement strategy effectively reduces inventory obsolescence and takes out the risk and uncertainty costs associated with having undesirable products, but it requires an integrated and agile supply chain to ensure that the latest demand forecasts can be frequently created and propagated through the supply chain to produce or allocate the right products for their customers. While postponement is conventionally thought of as a supply chain strategies, a little thinking will dispel this notion. Postponement is not an absolute choice, it is an imperative forced by the type of industry, assortment, and demand patterns. For example, a postponement strategy for delivering supplies to a trauma center or cereal to a grocery store are just not practical choices, even though it may allow for delivery of specific medical kits optimal for the type of trauma or the correct size of cereal packages in response to the actual demand. Therefore, medical supplies manufacturer cannot select postponement as their supply chain strategy any more than a grocer can postpone delivering their cereal. However, in few situations the production and demand patterns may allow postponement to become a business option, in which case, the supply chain must be designed to support that choice – an example is Avon as provided by Shoshanah Cohen and Joseph Roussel in their book on Strategic Supply Chain Management. Avon declined to label their bottles themselves for a long time, viewing this as additional cost and complexity. However, after developing an end-to-end supply chain visibility, Avon saw the opportunity in postponing the creation of its final product by placing the labels in the desired target language. It successfully deployed an idea that had been pushed out earlier, after understanding that this allowed them to postpone the production of final finished goods and better align their supplies to the end-demand without tremendously increasing their inventory. The situations in which postponement may be an explicit choice to be made for a supply chain are limited, but may become real options for specific categories of products or sales channels of a company. For example, Dell has mastered the art of postponement for their custom-designed machines for individual consumers. When Dell started, this was not necessarily the case in the industry, however, Dell invented a new business model and leveraged postponement as a business model – not as a supply chain strategy – though, it then designed their supply chain to support this business model. That is the distinction I want to make clear – postponement as a business model which then drives the supply chain strategy and not the other way around. And that is also the reason for why I believe that postponement as a supply chain strategy puts the facts on their head – supply chain strategy must follow a business strategy and not the other way around! In the next article, I will talk about the speculation as a supply chain strategy and why that too falls short of truly being a strategy for supply chains. Keep tuned!